Innerspace Watersports Annual Kayak Demo is back! Try all makes and models of kayaks, SUP, canoes & inflatables. The best way to try before you buy! 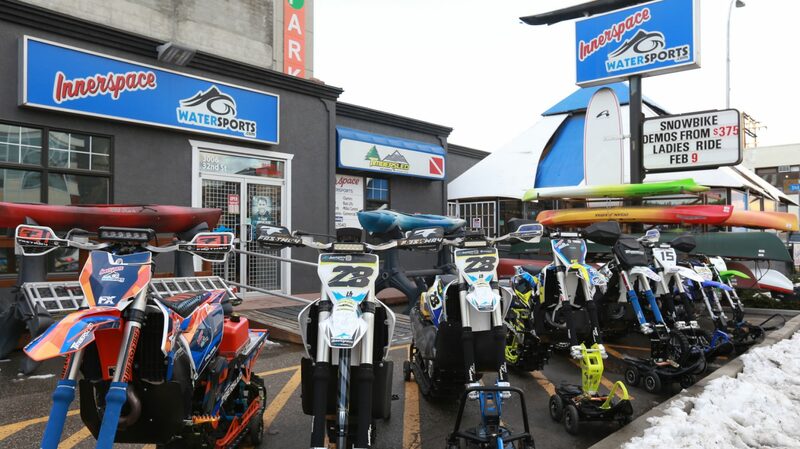 Innerspace Watersports 2018-2019 Timbersled & Yeti SnowMX Snowbike Demo Fleet – Book Today! Innerspace Watersports offers a unique snowbike experience in the beautiful mountains of BC. Choose one of their custom built snowbikes and have the opportunity to try before you buy! Learn More. Innerspace Watersports Annual Two-Day Fall Demo Event is back! Event will be held at Wood Lake in Oyama across from the General Store. 10am-4pm Sept 15 & 16. Here is your chance to sample all makes and models of kayaks, canoes and stand up paddle boards. Everything is priced to sell & you get the chance to try before you buy. Brands including: Necky, Ocean Kayak, Old Town, Riot, Boreal Design, Aquaglide, Amundson and more! Introducing the all new Malibu Pedal from Ocean Kayak. Dive in feet first with the Malibu Pedal. It features an advanced PDL Drive System that makes for a fresh new kayaking experience. It’s fun, zippy, stable and has turn-on-a-dime performance. A kid’s jumpseat makes family outings a breeze, and it even has plenty of room to bring your dog along for a complete family adventure. Product Info. As scuba divers we have the opportunity to explore some of the most beautiful and unique forms of life on our planet. BC has some of the most pristine waters to dive, from the abundant life forms of the West Coast to fresh water lakes and dive sites in our own backyard, the exploration boundaries are limitless. Innerspace took a small group of divers on a trip to Pavilion Lake June 22-24 to dive the microbialites (a type of stromatolite) that has become the subject of research by NASA, the Canadian Space Agency, and institutions from around the world. These corals take years to form and are some of the oldest organisms on the planet. Innerspace runs PADI scuba courses all year round. In just 4 days you can become an open water scuba diver and start exploring the underwater world and join us next time we head to Pavilion! Innerspace is excited to announce the launch of the all new Doppler Paddle Board. The Doppler has been Riot’s best selling epoxy board since they first opened their doors. Now in thermoformed ABS This is because it’s simply a joy to paddle. It has all the glide you’d want in a board designed to carry you effortlessly across your lake, and have the stability you’d want in open ocean conditions. The recessed standing area increases stability significantly without having to make it impossibly wide. This allows you to paddle it keeping feet dry and secure knowing you’re spending your day paddling, not swimming after your board. Its superior Tuff-Stuff epoxy construction means you don’t have to baby it like you would a carbon board, while still keeping the overall weight at an acceptable level. If you’re looking for one board that truly does it all, from fitness paddling, to excursions with your kid on board, to fishing and even messing about in some waves, you’ve found the right board. The Doppler uses our patent pending skeg system rather than a conventional fin, offering superior tracking, reduced concern about catching rocks and other submerged objects, and greater ease of use. Innerspace Watersports Free Watercraft Demo Days Event, Mother’s Day Weekend, May 12 & 13, at Wood Lake in Oyama! Demo all brands and models of canoes, kayaks and stand up paddle boards! Enter to win 50% off a Johnson Outdoors Kayak! Trade in incentives if you want to upgrade! OR, purchase before May 12th and find something you like better at the demo, just pay the difference. Can’t make the demo? Come into Innerspace, check out the new products and get ready for summer. Snow Check time is now!! Innerspace invites you to visit the shop for the kick off to spring event! Come down to the Vernon location as we unveil the brand new 2019 Timbersled ARO 120 LE and the all new 2019 Yeti 129 SS kit. One evening of food & refreshments, in store specials, snow check incentives and more! Event will be held on April 11 from 5-8pm and you can check out the new snow bike kits and upgrades, see our new Electric Fat Bike, learn about upcoming spring specials and demos PLUS tips from the pros on everything snowbike!! Check out the latest addition to the line up at Innerspace Watersports! We are proud to welcome the all new fat bike from the Electric Fat Bike Company to the shop. Locally made in Vernon by young entrepreneur, Kalyn Webster, these bikes are flawlessly designed to take you anywhere you could imagine, all year round! Innerspace is now offering the Electric Fat Bike for $1899! Also offering a wicked summer rental package that allows you to rent the bikes and ride down to Kal Lake where you can hop on a paddle board or kayak and enjoy a lovely afternoon out. Stay tuned for updates and pricing!